It is Noggin's birthday. Being a kind king, he prefers to give than to receive, so he gives musical instruments to all the children in the town. The children, delighted with their presents, parade through the town with Noggin, playing the instruments as they go. They end up in the harbour, where they board a large boat as their parent look on from the quayside. They row out into the middle of the harbour and start to play "Noggin's Birthday Tune", when suddenly the boat is lifted clean out of the water by a large, playful whale. 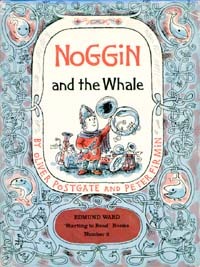 Noggin instructs the whale to put the boat back down, and they row to the other side of the harbour to get away from the whale. All is well as the children start to play the tune until the whale reappears, again lifting the boat high out of the water. The now annoyed Noggin tells the whale to leave the harbour, and the sad whale swims towards the harbour entrance. However, he comes to an abrupt stop in the harbour mouth and refuses to move. With the harbour master jumping up and down and the returning fishing boats unable to enter the safety of the harbour, the Nogs try everything they can to shift the whale. They try pushing, pulling and lifting the whale, but to no avail. Then Knut has an idea, and asks the whale if he also wants an instrument to make music. The whale seems delighted by the idea, but the Nogs are unable to decide what sort of instrument is appropriate for a whale, so Olaf decides that he will make a special instrument. Also included in "Three Tales of Noggin (Volume 1)"